I was recently asked what my scholarly influences were, and in the moment my brain wasn’t communicating effectively with my mouth. After the conversation I kept wondering how I could have possibly left out this person! And that book! And all the other names on the books that are currently stacked on my desk! Augh, missed opportunities to geek out! So sad. I think one of the reasons so many of the writers and books that have shaped who I am as a writer and a thinker escaped me–apart from the fact that at the time I was experiencing the effects of chronic sleep deprivation and elevated cortisol levels–is because I just haven’t been (re)reading my faves, and I rarely get a chance to geek out about them. These days, I feel like I never have time to read just to read. I mean, I read a lot. But it’s always for class or to write a particular thing. I haven’t read just for me in way too long. And I haven’t geeked out about something I’ve read for no other reason than to geek out in a long time, either. I mean, I am a nerd, and I geek out in my writing and teaching all the time. But again, mostly to do a particular thing, not just for fun. So, I’ve decided to start my own Geek Out Book Club. I really want to read more disability studies and media studies, so that’s what I’m focusing on. I aim to revisit my current influences and seek out new ones. Anyone want to join me? We don’t have to read the same things, though you’re welcome to join me on that journey, too, if you want. I’m planning to review books I read on this blog and on twitter using the hashtag #GeekOutBookClub. If anyone else wants to join in, maybe we can have a #GeekOutBookClub twitter chat once a month? Or just use the hashtag to share reviews and ideas from stuff we’re reading? C’mon! Let’s geek out! Image description: Nine books are lined up on a dark brown, wooden book shelf. A book stop cut from blue geode holds the stack upright on the right side, and the tips of spider-plant leaves can be seen hanging down from the shelf above on the left. 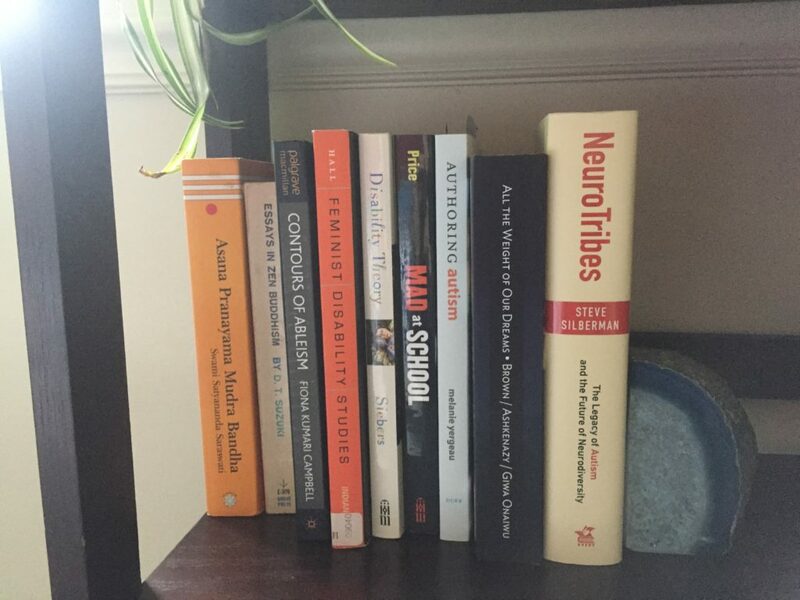 From left to right, the titles include Asana Pranayama Mudra Bandha, Essays in Zen Buddhism, Contours of Ableism, Feminist Disability Studies, Disability Theory, Mad at School, Authoring Autism, All the Weight of Our Dreams, and Neurotribes. I am not holding myself to reading one book at a time nor finishing something before I start something else. When I do that, I invariably want to turn my attention to something else, don’t let myself, and then stop reading the thing I started reading not because I’m not into it, but because I’m not always in the mood or maybe subconsciously resent the fact that I’m not reading that other thing I want to read. So I’m going to let myself work on a short list of books at a time and see how that goes. My first group is half stuff I’ve only just started (Brown, Ashkenazy, & Giwa Onaiwu and Clare) and half stuff I’ve read before and need to revisit (Hall and Haller). I’ve started all of the things in this second group except a book from the reading list. I am impatient to read this stuff. I’m going to try to at least finish the two new books in the first group before moving on, but I won’t hold myself back if I decide I really want to jump ahead. Something off of this Feminist Media Studies reading list. (Anyone know who made this list? I’m sure I ran into it on twitter, but then I neglected to make a note of who put it together. :/ ) Maybe I’ll start with Postfeminist digital cultures: Femininity, social media, and self-representation, by Amy Shields Dobson. If anyone has any suggestions for titles on this list that include disabled perspectives, please let me know, as that’s where I’d like to go next. Out of this last group, I’ve read Campbell’s book, but I want to revisit it alongside Goodley’s which I’ve only read part of. I’ve had Kafer’s book sitting on my desk for over a year during which time I’ve often referenced it as something I need to read that I know will be super useful for my work. And I am kind of embarrassed* to say I haven’t yet read Silberman’s book beyond giving it the three-page-test (passed with flying colors, of course). I’ll remedy that soon enough. Recommendations for disability studies and/or media studies stuff I should read? Hit me! And if you’re interested in taking part in a #GeekOutBookClub chat, please drop me a line or tweet at me and let me know what day/time works best for you. Right now I’m thinking of posting a review and holding a chat about a month from now, and my best days to geek out in real time are Thursdays-Sundays. * I really need to get over my Embarrassment over Not Having Read All the Things. I will never be able to read all the things, even all the things I ‘should’/want to. And that’s ok. What a horrible world it would be if I suddenly found myself to have read all the things!